This is Wild Boar's childhood favorite snack. 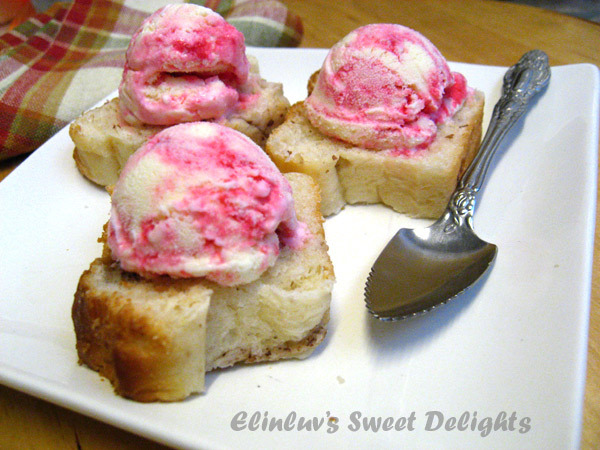 Ice cream on bun ! 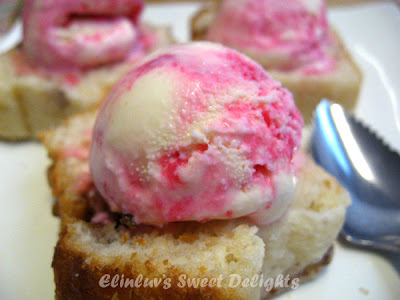 I recreated this delectable snack for him since I have one Mini Walnut Loaf left in the fridge from my previous bake. 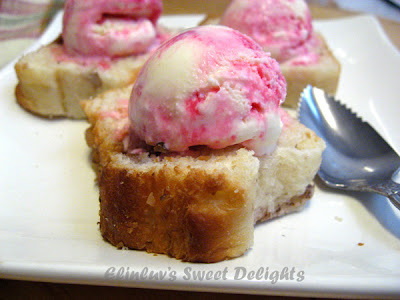 I warmed up the loaf and sliced them into 1/4" thick slices and placed them on a dessert plate with a scoop of store bought raspberry ripple ice cream on top of each slices . 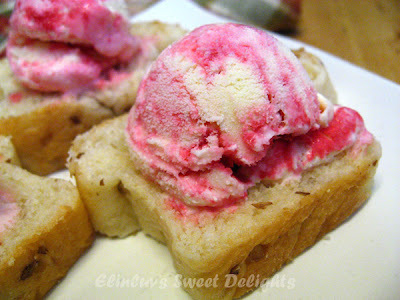 Though it may not be exactly like those he used to have with the ice cream sandwiched between a bun, this is just as good to tie over his childhood cravings :) I love it too....what a wonderful snack especially when the weather is scorching hot ! It was the perfect treat for this type of hot scorching weather . It gave a twist to the normal way of serving ice cream. 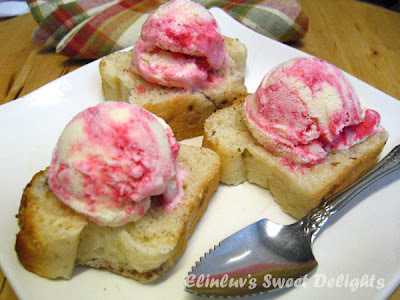 Do try eating ice cream this way, especially if you can find a hamburger bun , sandwich your favorite ice cream in your bun and you tell me whether you love it a not :p Anyway, to the Wild Boar eating ice cream on a bun/bread brought back childhood memories of him waiting for the ice lolly man who comes to his school after school ends. That was like some forty years ago....LOL! I remembered eating this:D Definitely delicious! Oh yes ! reminds me of the ice cream cart that always drop by my house downstairs with that bell when school ends ! 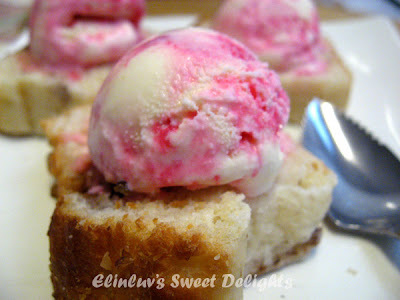 I love raspberry ripple too ! Joyce....haha me too, I love raspberry flavored stuff...let alone ice cream !!! I had this when I was young, brings back sweet memories! Weather is crazy, soooooo hot and humid! Elin, my mum still like to have ice cream on a coffee shop type white bread. You are right, the weather is killing and you know it when the scoop of ice cream melt so fast. This is just brilliant...I must try this.